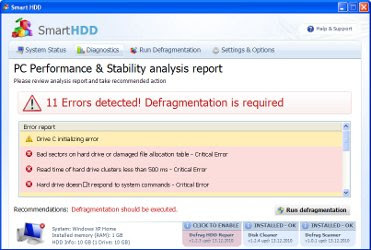 Smart HDD is a fake computer optimization software that displays false information that your computer has a lot of critical problems with hard disks, memory, etc. It "detects" these problems in order to trick you into purchasing so-called full version of the software. Like other malicious programs from the same family of fake optimization tools, Smart HDD can be installed without you noticing that, through the use of trojans. It does not require your agreement! If you will attempt to scan your computer with Smart HDD, it will detect 11 critical errors. Remember, the scan results are a fake, this malware is unable to detect any problems. So you should never trust this fake application and ignore all that it will display you. As you can see, SmartHDD pretends to be a legitimate PC optimization tool but, in reality, is a totally scam. You should remove it as soon as you notice it installed on the system. Follow the Smart HDD removal instructions. I wanted to thank you very much for your instructions on how to remove Smart HDD. Your removal process worked perfectly. I hope you have a great holiday.